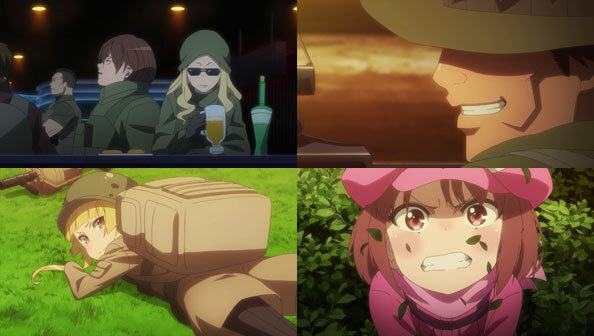 LLENN is initially worried MMTM will kill Pito, but she had nothing to worry about, because Pito confirms that old adage about cornered and wounded being the most dangerous animal. With a remnant of M’s shield and her Darth Maul-esque double-edged lightsaber, she gruesomely dispatches MMTM one by one. They’re simply outmatched in intensity and insanity. LLENN is finally feeling the weight of promising kill…THAT. LLENN stays crouched in the brush trying to think of a plan, but coming up empty. Meanwhile, Fuka and SHINC decide the only thing for it is to charge recklessly, which they do, and M and Pito fill them with holes. One by one the Amazons fall, but they fall smiling, figuring that if they were never going to win the SJ at this point, they might as well go out in a blaze. Fuka, meanwhile, has all her limbs blown off but still won’t give up, irking M and Pito but also making them respect her. Eventually, going over everything that went wrong in this SJ, LLENN has had enough, bursting out of the brush, but away from the cabin, not towards it. 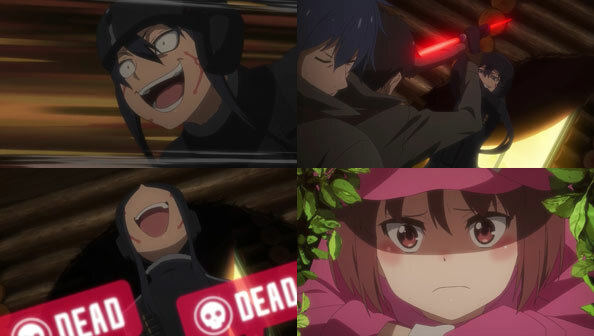 Her friends succeeded in unlocking “Psycho LLENN”, the only kind of LLENN who’ll be able to kill the even more psycho Pitohui. Pito and M give chase in a Humvee, but when they charge her she slides underneath its generous ground clearance, and they crash into a pond. Unfortunately for LLENN it’s a shallow pond. 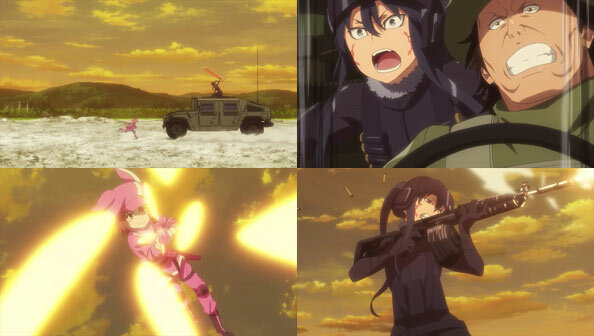 Pito and LLENN get into a shooting match, and LLENN is hit and almost gives up, but Fuka, her limbs regrown, arrives in another Humvee to rescue her. Turns out she got pretty good at driving from video games as well. After a brief but thrilling car chase (the lumbering Humvees, while capable, eventually run out of fuel), LLENN is forced to rush at Pito using a willing P-chan as a shield. She stomps Pito in the face and disarms her, putting the two in close quarters with no guns. Pito is grinning ear to ear; LLENN…isn’t. In the most prestigious tournament of a game about shooting guns, the final showdown may come down to knives, fists, feet…even teeth. That is, unless Pito is hiding other weapons in that suit of hers. The question is, who will be the last woman standing?